MONOBLOCK SUBWOOFER AMPLIFIER. JL AUDIO JX1000/1D. 1,000 watts RMS x 1 at 2 ohms. 500 watts RMS x 1 at 4 ohms. Mono subwoofer amplifier. CLASS D AMPLIFIER. Class D amplifier design. 2 ohms: 1000 Watts x 1 chan. 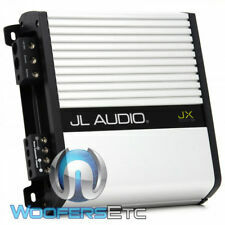 JL Audio JX1000/1D JX Series 1-Channel Full range Class D Car Amplifier. 4 ohms: 500 watts x 1 chan. Input sensitivity 2 ohms: 1000 watts x 1 chan. JX Series 1-Channel Class D Car Amplifier. Damping factor: >1000 @ 4 ohms. Trending at $329.95eBay determines this price through a machine learned model of the product's sale prices within the last 90 days. JX500/1D - JL Audio Monoblock 500W RMS Class D JX Series Amplifier. Mono subwoofer amplifier. Class D amplifier design. Variable low-pass filter (50-200 Hz, 12 dB/octave). Frequency response: 10 Hz - 150 Hz. Crossover / Equalizer. Amplifier Type Mono Channel. MOSFET Circuitry Yes. Channels Mono. RMS Power at 2 Ohms 600 W x 1. Bass Boost Without Bass Boost. Model XD600/1v2. THD at Rated RMS Power 1 %. Up for grabs is a JL Audio 1000/1V2 Amplifier Mono Subwoofer Amp purchaser new by me to run a 13w7. I’ve now upgraded to a second 13w7 and a larger amp so this one has to go. It’s in excellent working order and puts out 1000 watts from 1.5-4 ohms. This is a workhorse amp with excellent sound quality. There are a couple of small scratches on the amp fins as seen in the pictures but they don’t affect performance. The amp pictured both internal and external pics are of the exact amp being sold here. 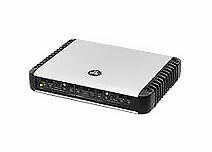 Shipping is a flat $55 anywhere in the contiguous United States as this amp is HEAVY! New ListingJL Audio 500/1 1-Channel Car Amp Old school bad boy! 4.5 out of 5 stars - JL Audio 500/1 1-Channel Car Amp Old school bad boy! 82 product ratings82 product ratings - JL Audio 500/1 1-Channel Car Amp Old school bad boy! jl audio 500/1 Mono Amplifire. Condition is Used. Shipped with USPS Priority Mail. The housing has light scratches, dust residue and other markings. The car amp is working well with no known issues. This includes Canada. Amplifier has been thoroughly tested and works perfectly. Amplifier shows very little signs of wear, has a few light scratch marks on the orange label, no dents, dings, cracks, rattles, or previous owner's markings. JL Audio Slash Series 1000/1 Car Amp. Condition is Used. Shipped with USPS Priority Mail. Some knicks and scratches. Nothing that affects function. JX Series 1-Channel Class D Car Amplifier. 3-Way System Protection circuitry (thermal, low impedance, and speaker short protection). 2 ohms: 1000 watts x 1 chan. Input sensitivity 4 ohms: 500 watts x 1 chan. This is a JL Audio 250/1 mono subwoofer amplifier. VERY LOW RESERVE! I sold and installed JL Audio for many years. I bought this amp to build a new sound quality vehicle and life had different plans. JL Audio 1000/1V2 1-Channel Car Amp. Condition is New. Condition is Used. A couple minor scratches. works great. i had it running about half power on 2 JL 10W3D8 running at 2 ohms and it never got hot. solid amp. 1,200 watts RMS x 1 (rated power from 1.5 to 4 ohms). mono sub woofer amplifier. differential-balanced inputs eliminate noise from your vehicle's electrical system. JL Audio 500/1 1-Channel Car Amp. Condition is Used. Shipped with USPS Priority Mail. Scratches, minor scrape marks around the edges and light stains. There is also rust on the wire screw and dust in the connection ports and other crevices. The amplifier has been tested and is in overall good working condition and ready for installation. Condition is Used but Flawless. Targeted specifically for subwoofer applications, the XD300/1v2 includes a variable slope low-pass filter with continuously variable cutoff frequency selection from 50-500 Hz. JX250/1D - JL Audio Monoblock 250W RMS 500W Max Class D Amplifier. Monoblock subwoofer amplifier. Class D amplifier design. Variable bass boost (0-12 dB at 45 Hz). Variable low-pass filter (50-200 Hz, 12 dB/octave). HX300/1 - JL Audio Monoblock 300W Class D Full-Range Powersports Amplifier. Monoblock Class D Full Range Amplifier. Switchable Input sensitivity: 250 mV-4 V (Low) to 750 mV-15 V (High). Stainless steel hardware for durability. MONOBLOCK SUBWOOFER AMPLIFIER. JL AUDIO JX500/1D. The JX500/1D mono amp puts out up to 500 watts RMS to your sub, so you'll experience thunderous bass in your music. Use the variable low-pass filter and bass boost to tune the amp to your subwoofer system. Mono subwoofer amplifier. Class D amplifier design with NextD switching amp technology. 250 watts RMS x 1 at 4 ohms (500 watts RMS x 1 at 2 ohms). variable low-pass filter (50-500 Hz, 12 dB/octave). Other Features. 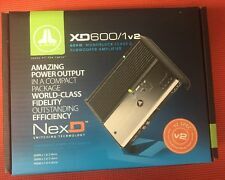 For sale is this nice preowned JL Audio XD600/1 car amplifier. The amp is in great working order and performs like new. Also missing its top cover plate. Can’t go wrong with a JL AMP! 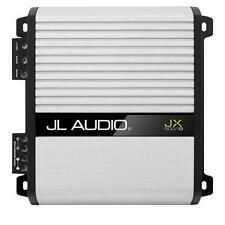 JL Audio JX1000/1D 1-Channel Car Amp 1000 Watts 1000 RMS. Condition is used but excellent. JX1000/1D - JL Audio Monoblock 1000W RMS 2000W Max Class D Amplifier. JX Series 1-Channel Class D Car Amplifier. 3-Way System Protection circuitry (thermal, low impedance, and speaker short protection). JL Audio JX250/1 1-Channel Car Amp. Condition is Used. Shipped with USPS Priority Mail. Class-D 2-Ohm Stable Monoblock Amplifier. JL Audio RD500/1. One (1) JL Audio RD500/1 RD Series 2-Ohm Stable Class-D Monoblock Subwoofer Amplifier. 2 ohm: 500 watts x 1 chan. 1 ohm: ------------N/A ------------. RD1000/1 - JL Audio Monoblock 1000W RMS RD Series Class D Amplifier. Class-D Monoblock Amplifier. JL Audio RD-Series RD1000/1. CEA-2006 Compliant Amplifier. 3-way protection circuitry (thermal, overload, and speaker short protection). RD500/1 - JL Audio Monoblock 500W RMS Amplifier. 250 watts RMS x 1 at 4 ohms (500 watts RMS x 1 at 2 ohms). Mono subwoofer amplifier. Class D amplifier design with NextD™ switching amp technology. Variable bass boost (0-12 dB at 45 Hz). The JX500/1D mono amp puts out up to 500 watts RMS to your sub, so you'll experience thunderous bass in your music. Use the variable low-pass filter and bass boost to tune the amp to your subwoofer system. JX Series 1-Channel Class D Car Amplifier. 3-Way System Protection circuitry (thermal, low impedance, and speaker short protection). Any claim relating to the use of this site, its materials and any sales thereunder is governed by the laws of the Commonwealth of California, without regard to conflict of laws rules and California will be the sole jurisdiction and venue for any litigation arising from the use of or orders made on the site. 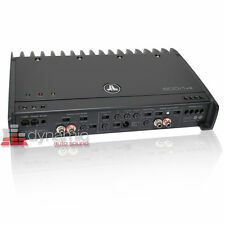 JL AUDIO 500/1 Mono 500W @ 1-Channel Car Amplifier - See Photos & Details! 500W @ 1-Channel Car Amplifier. 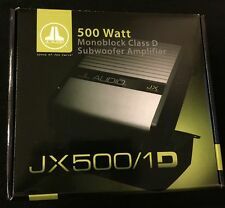 JL AUDIO 500/1 Mono. TMA T500.1 car amplifier made by JL Audio Has scratches and scrapes consistent with being used Tested and works great! Please visit manufacturer website for full specs Please ask any questions before purchase All electronics sold as is No returns No warranty Shipping to 48 states only No low or negative feedback buyers PayPal confirmed buyers only If you have zero feedback your order will be canceled Check my feedback and purchase with confidence!! Trending at $195.00eBay determines this price through a machine learned model of the product's sale prices within the last 90 days. 250W RMS Monoblock Class-D Amplifier. 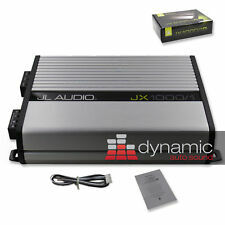 One (1) JL Audio JX250/1D 250W Monoblock Class-D Car Audio Amplifier. Our enthusiastic audiophile staff are here to create the best sound systems that work for you and your needs. 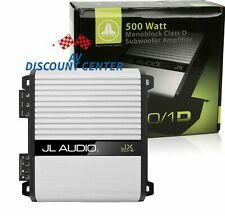 JL AUDIO XD1000/1V2 CLASS D MONOBLOCK SUBWOOFER AMPLIFIER "BRANDNEW"
JL AUDIO XD600/1v2 600W CLASS D MONOBLOCK SUBWOOFER AMPLIFIER "BRANDNEW"
An amplifier can help power the sound components in your vehicle. If you feel that you are not getting the full potential out of your system, it is time to upgrade. JL Audio carries a full line of audio products to boost the quality of your system. JL Audio is based in Miramar, Florida. They have been creating car audio systems since 1975. They make products that can be used in the home, in the car, or on a boat. JL Audio car speakers are made in the USA. What is a monoblock and how is a mono amp used? A monoblock amplifier means it has one channel. This amplifier will have only one input and one output. You can always tell if an amp is mono or several channels by looking at the labels on the speaker terminals. If it is a multichannel amplifier, the channels will be labeled "left" or "right." Mono amplifiers are used for various purposes. The most common is to power the subwoofer in a car audio system. Since the subwoofer does not need much power, it only requires a mono channel. If you have multiple subwoofers, you can always connect two mono amps together. What components are used in a car audio system? There are many products available to give you a customized sound. Quality car speakers can eliminate most noise from the system. The subwoofer will add more depth and tone to the audio. The amp is the component that powers all the others. How much power should the amplifier produce? You need to take a look at what part you want to power. Speakers will require more power than a subwoofer and will need a multichannel amp. Mono amps are typically used to power a single component such as the subwoofer. What monoblock series are available and how to install them? The amplifier can be installed almost anywhere in the car. Before beginning an installation, make sure to measure the equipment. You need to have enough space for all the components to fit. Take care to fasten the amp to the car. It has components that can be damaged if it is not properly secured. Some places to install the monoblock include the trunk, the door panel, and under the seat. Content provided for informational purposes only. eBay is not affiliated with or endorsed by JL Audio.